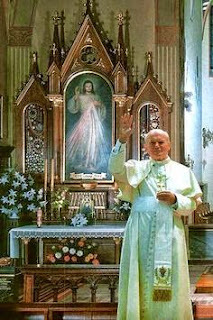 Divine Mercy: 881 Today, Jesus entered my room wearing a bright robe and girded with a golden belt. 881 Today, Jesus entered my room wearing a bright robe and girded with a golden belt. His whole figure resplendent with great majesty. He said, My daughter, why are you giving in to thoughts of fear? I answered, “O Lord, You know why.” And He said, Why? “This work frightens me. You know that I am incapable of carrying it out.” And He said, Why? “You see very well that I am not in good health, that I have no education, that I have no money, that I am an abyss of misery, that I fear contacts with people. Jesus, I desire only You. You can release me from this.” And the Lord said to me, My daughter, what you have said is true. You are very miserable, and it pleased Me to carry out this work of mercy precisely through you who are nothing but misery itself. Do not fear; I will not leave you alone. Do whatever you can in this matter; I will accomplish everything that is lacking in you. You know what is within your power to do; do that. The Lord looked into the depth of my being with great kindness; I thought I would die for joy under that gaze. The Lord disappeared, and joy, (253) strength and power to act remained in my soul. But I was surprised that the Lord did not want to release me and that he is not changing anything. He has once said. And despite all these joys, there is always a shadow of sorrow. I see that love and sorrow go hand in hand. 882 I rarely have such visions. But I more often commune with the Lord in a more profound manner. My senses sleep and, although not in a visible way, all things become more real and clearer to me than if I saw them with my eyes. My intellect learns more in one moment than during long years of thinking and meditation, both as regards the essence of God and as regards revealed truths, and also as regard the knowledge of my own misery.